From the velocipede (pictured above) to buses, vehicles powered by steam were being beta-tested throughout the late nineteenth and early twentieth centuries. The results were pretty weird, and hint at a steam-powered future that never happened. 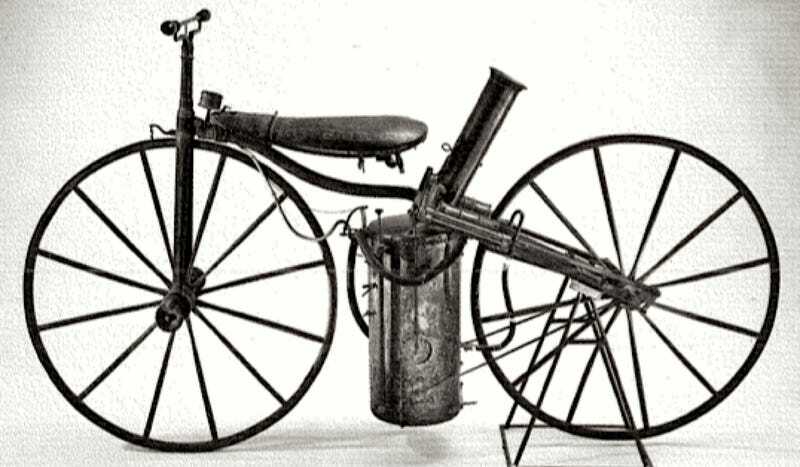 A small steam engine was attached to a velocipede – it was the first motorcycle. The colorful steam trucks and tractors were common in the first years of the 20th century. The twin-engines (by Stanley Steamer) weren't syncronized, so the driver, Louis Ross himself had to operate two throttles simultaneously. The world's first fully-tracked vehicle was built in the first years of the 20th Century. Later the company has sold its patent rights of the "chain track" to the American Holt Tractor Co., which is now called Caterpillar. The three-wheeled steam tank with a Doble 2-cylinder 75 hp steam engine was built by the Holt Manufacturing Company (now Caterpillar), based on the British "Big Wheel" Landship concept. Only one prototípe was built. The biplane based on a Travel Air 2000 flew several times at Oakland airport in 1933. Had a two-cylinder, 150 hp Doble engine. In 1969, the company developed a concept vehicle with a 50hp Bresler steam engine, which was based on the 1920 Dober steam engine concept. The original small block Chevy 305 engine was sawed in half to make place to the boiler and the other new parts. The modified car had a two minute warm up time: it took 30 seconds to make steam and another 90 seconds to warm up the other parts. This steam-propelled Batmobile-like car holds the World Land Speed Record for a steam powered vehicle with a 148 mph (239 km/h) record. It broke a 103 years old record. The Inspiration is powered by a two stage turbine, which receives the steam from 12 boilers full with distilled water.